Why are we growing corn to fuel our cars? Three reasons why ethanol is a bad idea. 1. Ethanol lowers your gas mileage–a lot. Ethanol only has about 2/3 the energy content of gasoline, meaning it simply cannot provide the same amount of power per gallon (or liter) as gas. 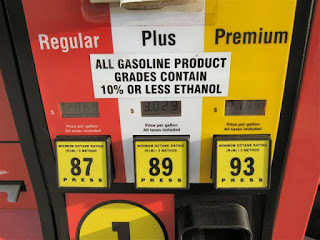 E85 fuel, which uses 85% ethanol and 15% gasoline, is widely available, and some gas stations now offer no alternative. Consumer Reports put E85 to the test, and found that highway mileage decreased by 29% and city mileage by 22%. Car and Driver ran their own tests and found a 30% drop in mileage on E85. 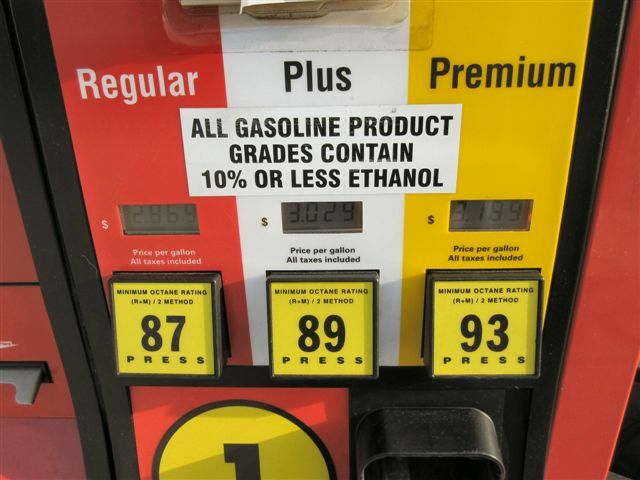 According to the Union of Concerned Scientists, nearly all gas sold in the US today has 10% ethanol–much less than in E85, but still providing lower fuel efficiency than straight gasoline. 3. Increasing fuel efficiency means we’ll never be able to meet Congress’s mandated levels of ethanol usage, not unless we sacrifice even more gas mileage. Automakers have made great progress in producing more fuel-efficient cars, and the growing electric car market (Tesla!) mean that we’re using less and less fuel each year. This is terrific for reducing carbon emissions, but it means that Congress’s original mandate to use more ethanol becomes far harder to satisfy. What happened was that back in 2005, Congress told us how to solve a problem (carbon emissions from our cars), instead of just encouraging us to solve it using innovative new ideas. Corn producers and their government representatives—governors, Senators, Representatives—all got behind the ethanol “solution” because they saw increased profits in it. Now we are stuck with a non-solution that, as the NY Times recently put it, is “a boon for Iowa and a boondoggle to the rest of the country.” It’s long past time to end the ethanol mandate. Fifteen years. That's how long scientists have been trying to prove a negative: that "chronic Lyme disease" does not exist, and that long-term antibiotic usage does not help with symptoms that include joint pain and fatigue. This past week, a study in the New England Journal of Medicine showed that long-term antibiotic usage–the favorite treatment prescribed by doctors who call themselves "Lyme literate"–is a failure. Will it convince any of those doctors to change their practice? I doubt it. 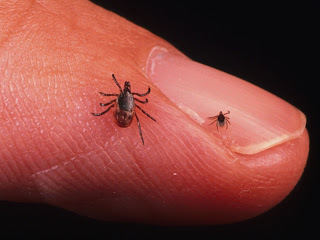 Lyme disease is a serious illness, caused by bacteria that are transmitted through tick bites. Although the disease has been infecting humans for centuries, it got its name relatively recently, in 1975, when two Yale doctors, Stephen Malawista and Allen Steere, investigated a cluster of illnesses near the town of Lyme, Connecticut. The symptoms included joint pain that resembles arthritis, so much so that Malawista initially called it "Lyme arthritis." A few years later, biologist Willy Burgdorfer discovered the true cause, and the bacterium Borrelia burgdorferi was named after him. As deer have spread through the suburbs of modern society, ticks traveling with them have spread Lyme disease far and wide; the NIH reported over 36,000 cases in the U.S. in 2013. (Note that the CDC estimates the true number of cases may be closer to 300,000, ten times the number actually reported to health authorities.) Lyme is also common in Europe. "the lingering symptoms are the result of residual damage to tissues and the immune system that occurred during the infection." "Most cases of chronic Lyme disease require an extended course of antibiotic therapy to achieve symptomatic relief" and "many patients with chronic Lyme disease require prolonged treatment until the patient is symptom-free." "Case reports and uncontrolled trials describe success with prolonged antibiotic therapy, often with a recurrence of the symptoms after the discontinuation of therapy. In view of the substantial morbidity and even death associated with prolonged parenteral antibiotic treatment of Lyme disease, it is important to determine the efficacy of such therapy." "Substantial morbitity and even death": clearly, long-term antibiotic treatment is not something to be prescribed lightly. The 2001 study found no benefit from long-term versus short-term antibiotic usage for the treatment of Lyme disease. Despite the science, some doctors persist in prescribing–against the advice of professional societies–long-term courses of antibiotics. Because the practice continues, a European group conducted a new study of long-term antibiotic use in patients who claim to have persistent symptoms from Lyme disease. Anneleen Berende and colleagues reported the results of this well-designed double-blind, placebo-controlled study in the New England Journal of Medicine just last week. Their findings matched those of the 2001 study: long term antibiotic use has no benefits for patients. The study had three arms: a placebo group and two different treatment groups, who were given two different antibiotics. Everyone got a two-week treatment with real antibiotics, followed by 12 more weeks of either antibiotics or placebo. The pills were created just for this study to look identical, so that neither the doctors nor the patients knew who was getting the placebo. "Patients with subjective, vexing symptoms attributed to Lyme disease should not anticipate that even longer courses of antibiotics will produce relief, a finding that is in concert with results from previous trials." I doubt that "Lyme literate" doctors will accept the latest results and stop prescribing long-term antibiotic use; their websites indicate that they already know that they are right. I hope, though, that patients will start to question doctors who put them on long-term, possibly harmful antibiotic regimens that don't provide any benefit.